Last summer members of FirstFollowers reached out to the community with a survey asking about the barriers and unmet needs of those reentering Champaign Urbana. 90% of people identified the lack of access to good jobs that pay a living wage and provide opportunity as a top issue. FirstFollowers has worked on this issue in a number of ways. They’ve reached out to employers, encouraging them to consider the skills and potential of individuals, even if they have a record. Building trust and relationships with employers can create more opportunities. FirstFollowers is especially interested in helping more people move into the trades – skilled work that pays well and provides a career path. Mitchell says FirstFollowers mentors also work with people to “build their skill sets.” This may mean helping someone overcome a fear of technology. Mentors use laptops at the Drop-In Center to teach people how to search for jobs, complete applications, and upload resumes. But there may be a more fundamental need to build basic literacy skills. Mitchell likens illiteracy and under-education of people who have been incarcerated to the history of African Americans being shut out of educational opportunities. The goal, says Mitchell, is to help people identify their goals, get the skills and education they need, and then have opportunities to succeed. Susan Burton’s new book Becoming Ms. Burton: From Prison to Recovery to Leading the Fight for Incarcerated Women offers a “Blueprint” for Community Organizing. Mentors recently read the book Becoming Miss Burton and they shared their reactions to it at a well-attended event at the Independent Media Center in July. Mitchell has had a chance to talk with Susan Burton on a couple occasions. “I had an idea about a reentry program before I even met her,” but Mitchell says she’s given FirstFollowers good advice and a “blueprint for training our mentors and addressing the underlying political issues.” Her reentry work moves beyond “one-off, one person’s experience to building a movement that has a strategic approach” for ending mass incarceration. FirstFollowers has just begun distributing a clear and concise guide that helps people link to the most important resources they need upon reentry – including current, practical information about how to obtain an ID and where to access housing, health care, food, clothing and other services. (The guide was produced in collaboration with University of Illinois professor Ken Salo and his Urban and Regional Planning class.) They have begun distributing the guide to local social service organizations, libraries, religious institutions, and even to the Champaign County Jail. You can request copies of the guide by contacting FirstFollowers. Come out to hear FirstFollowers September 30th at 4pm at the Champaign Public Library. A focus of the event will be fees and fines in the criminal justice system. 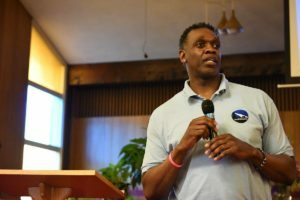 You can also check out the FirstFollowers website (http://www.firstfollowersreentry.com) or follow them on Facebook (https://www.facebook.com/firstfollowersreentry) to see personal testimonies, photos from their events, resources and links to other information and other reentry programs, or to donate to their work. Carol Inskeep is a local librarian and community member. This entry was posted in Community, Justice, Prisoners. Bookmark the permalink.